At Thrive, we focus on your vision and the specific needs of your business or institution, bringing a fresh design sensibility that integrates your brand with functional solutions to the challenges you face every day. We understand the evolving contemporary workplace and bring you dynamic places for seamless collaboration balanced with quiet spaces that enable privacy, concentration, and focus. What’s in it for you? Efficient workflow. And happy employees! Operations staff offices enjoy views to the biofilters that treat stormwater from the vehicle parking area. Located in the Monticello viewshed, the project integrates rich red brick with an industrial material palette. East-facing windows in the Maintenance Building are well-shaded from the morning sun. Inside, simple materials enliven the exposed structure of the pre-engineered metal building. Judicious use of glass and well-conceived overhangs ensure the interior environment is fully connected to the outdoors without significant sacrifices to energy performance. From the staff lounge, employees enjoy simultaneous views of the butterfly garden and the transit vehicle parking area. South-facing glass doors and north-facing clerestories provide abundant light to the vehicle maintenance areas. Employees enjoy ready access to natural spaces throughout the complex. Black-Eyed Susans brighten the biofilters at the end of each summer. Exterior solar shading devices are fabricated from industrial bar grating. South-facing glass is shaded from the summer sun. The CAT Operations Center includes offices, maintenance, fueling, washing, and parking facilities for Charlottesville’s growing transit fleet. 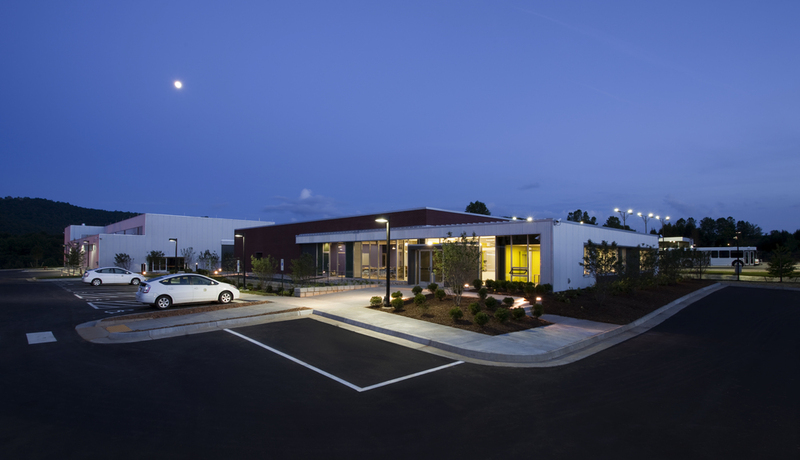 The LEED Gold-certified facility features rainwater harvesting, graywater re-use, and stormwater infiltration strategies that emphasize the critical need for water conservation. The facility also utilizes a first-in-Virginia standing column well ground-source heat pump design that has helped the city reduce the facility’s energy use significantly compared to the smaller but more inefficient building the division previously occupied. The custom metal screen conceals fixed louvers and admits light through high windows. Ground level storefront offers a compelling view of the equipment within. Variations in the spacing and orientation of fixed screen components give a lively appearance to the upper façade. Set at the edge of the university's developed area, the natural and the human-made offer stark contrast throughout the year--a machine in the garden. The screen is alternately opaque and transparent. The stair tower to the roof is wrapped in industrial bar grating. The straight-forward pre-engineered structure consists of precast architectural concrete columns, wall panels, and double-tee beams. With the interior lights off, the storefront reflect the beauty of the adjacent forest. Daylighting fills the interior of the chiller room. A cut-away perspective illustrates the relationship of structure, wall openings, and screen. UVa’s Massie Road Plant, located behind John Paul Jones Arena, will serve the heating and cooling needs for much of the projected build-out of the athletic precinct and North Grounds. This machine-in-the-garden is conceived as a simple container, with mechanical openings piercing the container as needed. A playfully detailed mechanical screen wraps the upper portion of the “container” concealing nearly all of the various intakes and exhaust. An artful logic establishes the pattern of slats in the louvered mechanical screen, sometimes concealing and sometimes revealing the nature of the surface behind the screen. Abundant windows provide plentiful daylight to the interior, while meadow-like landscaping harmonizes with the adjacent rural area character. 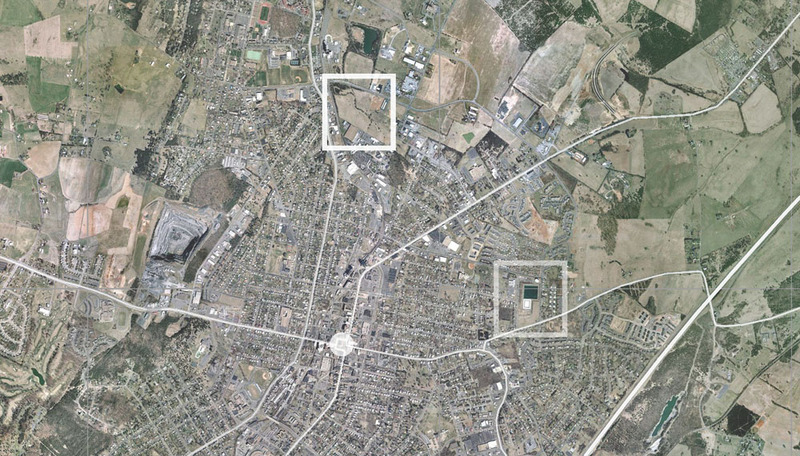 The redevelopment project would have relocated the transit operations center from a crowded hilltop site on the eastern edge of the city to a larger, flatter site on the northern edge of town. The new buildings are configured to preserve the existing tree canopy. The naturally-lit bus maintenance facility needs no artificial light during daytime work shifts. The City of Harrisonburg planned to develop a transit operations center for its growing bus fleet. This design-build proposal was located and conceived to reduce operational travel miles and increase the efficiency of the cleaning, fueling and maintenance regimes. The site plan was arranged to incorporate and extend a planned city bike trail and to restore a degraded stream and wildlife corridor along the site’s eastern edge. The project consisted of four buildings arrayed around the primary bus parking lot. The office building is situated in a native-planted meadow-scape that would promote on-site biodiversity and provide visual continuity with the agrarian Shenandoah Valley landscape.